It looks like the first graph is wrong–it looks just like the second graph. You’re right Brian. I got the images messed up in the WordPress upload window. I’ve corrected the graphs. The numbers are correct. environments were that were being compared might be useful to people. Good points John! To address these questions I have added the “The two systems” section. Hi, We have installed Oracle 10gR1 on Solaris10@T2000. Found that thhe read and write intensive process takes considerably too much time despite the super fast HD. Any clues ?? Also in the console window we see 16CPU vs 4Cores.?? Will appreciate any tips on Oracle setup under t2000. Can you please share the customization values in /etc/system for both systems that you tested? We actually did not apply any custom /etc/system values. Unfortunately we ran out of time in our trial and had to work on a relatively untuned system. The system will use 4 threads per core but top and other system utilities will treat each thread like a CPU. As for the performance problems, make sure you have applied all the appropriate patches to 10gR1 or go directly to 10gR2. I have heard lots of horror stories about optimizer problems in 10gR1. Beyond that, be careful of how you have the disk configured. If you’re doing a software mirror or (worse yet) software RAID you will probably kill all disk performance. Hope this helps. Sorry I can’t be more specific, but you know, every install is different. Did you make any changes to the Oracle setup (parameters)? We are testing a 9i installation using 11.5.10 apps on both SparcIII systems and a T2000. Users are complaining of slow performance on the T2000 instance. We’ve gone through tuning documents for the T2000 but I wonder about tuning the Oracle database/apps to utilize the threads technology. We didn’t tune the instance at all. We wanted it to be configured the same on both systems. As for taking advantage of the threads, as long as the database will run at least as many processes as you have threads (4 x number of cores) the operating system should take care of the rest. I’d bug your Sun reps if you can’t get the system to perform. They offered to help me at every turn when I had the demo. We are looking at using T1000 or T2000’s for the apps tier and maybe the database tier for 11.5.10. Oracle Applications. I believe Kurt has been having performance issues using 11.5.10 apps with a T2000, did you resolve the issue in the end Kurt? Did the T2000 beat the Sparc iii based servers and what were the server specs? Pingback: Life After Coffee » We win a Sun T2000! 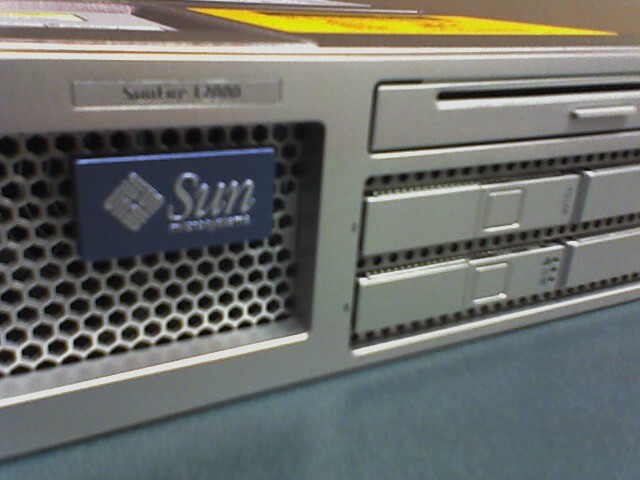 Our lab has several new V440 servers, purchased from our sun reseller MCA, http://www.mcac.com and they have also loaned us a T2000 to benchmark. We plan to run several test scripts, that we have written, that will demonstrate the performance & comparison of these two models. I will provide our test results & set-up shortly. I have recently set up Oracle on T2000. I am gettign slow performance complaint. Database import (130 GB) takes about 45 hrs on this box. On E3500 server, the same takes about 30 hrs. Could any one help me on tuning this . Thanks a bunch !! Since import/export is very read/write intensive I’d say the difference could be the disk. Are you seing lots of i/o wait in top? We are looking at using T1000 or T2000â€™s for the apps tier and maybe the database tier for 11.5.10. Oracle Applications. 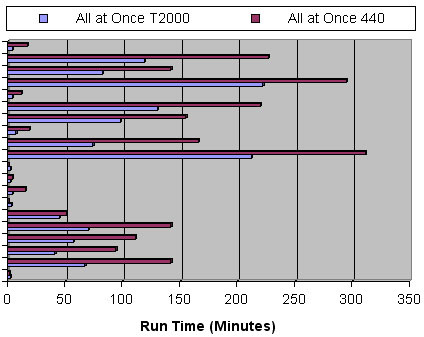 T2000 is a throughput based machine. If application has too much serial like a single threaded batch job, then performance will not match traditional architectures and may run longer.Such as export&import&alter table move etc. Would be a little slower on t2000…. environment on Sun Fire T2000 Servers? I’d like to know the comparision in performance against, say, the v880 or v440. Please let me know.. thanks in advance ! We are using the Banner system from SunGard Higher Education with an Oracle database. Has anyone had experience with the Banner Oracle database on a Sun T2000 server? Does it perform satisfactorily? The pricing of the T2000 is attractive, but performance is more important. First, in the interest of full disclosure, I am currently working for SunGard Higher Education, although I was not when I originally wrote this article. If you were to go with a T2000 you will obviously want to use some type of external disk array for your data. The T2000 drives are limited in capacity (they are the size of laptop drives) but are sufficient as system disks. Sorry I can’t give you more of a confirmation on this. You may consider putting in a support ticket or polling other schools through one of the client mailing lists. Have you also tested Oracle 10g on the T1000? I am trying hard on Google to find user experiences. Sun on their website recommends T1000 for web applications and not as a database server but I do not see significant changes in the specs between the T1000 and the entry level T2000 servers. This post is quite old. What’s the status now wrt Oracle performance on these servers? Any new experiences? Unfortunately in India I cannot avail the Try/Buy offer from Sun. Unfortunately I haven’t worked on the T2000 in a while and didn’t have the chance to evaluate 10g on it. You’re right that Sun pushes them as an application server, but the multiple cores and plenty of RAM make them solid for Oracle databases too. I’d love to see how they’d perform in a RAC configuration but unfortunately don’t have the resources or time.